We all know the primary benefit of a tankless hot water heater is that it doesn’t need to heat and store 40 or 50 gallons of hot water like conventional ones. Instead, as water is needed, it’s heated with a blast of gas or electric resistance heat. Instantly, your tankless water heater provides you water at temperatures higher than you’d ever need. There are many advantages to these types of appliances, and like anything super cool like this, there are certainly some disadvantages. Whether they are inherent to the tankless concept or having to do with features, accessories or brands, a good tankless water heater review is often the best way to get started. See below for some information about the pros and cons of this nifty home appliance. Then glance over the details of some of the best models on the market in the following: Home Tankless Water Heater Review or Point-of-use Tankless Water Heater Review. If you’re looking for a tankless water heater review, you may or may not be new to this smart alternative to traditional water heaters. Also called instant hot, flash or on-demand hot water heaters, the tankless heater as some pretty substantial advantages. The biggest is that you can save energy. Energy efficient tankless water heaters, whether gas (natural gas and propane fuel) or electric, don’t have to keep water hot while it’s not being used. In that sense, it seems silly to have anything other than a tankless solution for your hot water. If you can truly get it on demand, why store it in a large tank, keeping it hot, for when you need it? 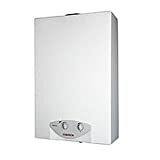 After the installation of a tankless hot water heater, your electric or gas bill will instantly be lower! It goes without saying that a tankless water heater is definitely a green appliance, and a must for any “green home” improvement project. Perhaps the next biggest benefit of a tankless water heater is it’s performance. As long as it’s not overloaded, you virtually have endless hot water. Imagine never running out of hot water! It can just continue to heat the water supply for as long as you need it. And in terms of longevity, a tankless hot water review would not be complete if it didn’t measure the life-expectancy of such a device. These guys can last much longer than traditional types, as much as 15 years longer. Another big advantage is that without a tank, you don’t need a lot of space for installation. So, depending on your setup, saving space may be very important. Finally, let’s not forget the tax savings you get with a tankless heater. The federal government has made these appliances tax credit eligible. Again, if you’re reading a review on tankless heaters, then you probably are aware of the biggest drawback to buying one of these – and that’s the fact that you have to buy something that isn’t considered cheap. You probably want to review a tankless hot water heater guide to find the least expensive models, or at least the ones with the best value. Certainly, in the long run, you will recoup your investment. But it could take some time if you consider it may save you a couple hundred dollars a year. Also, in terms of installing a tankless water heater, you could run into some potential challenges. For example, you may have to think about larger gas or electrical lines and vents to install a tankless heater. Another disadvantage is that while they do supply endless hot water amounts, a smaller unit could have a hard time keeping up if multiple demand sources are placed on it simultaneously; for example, a couple showers, dishwasher and clothes washer all running at the same time. Also, filling large bathtubs all at once could present a problem for smaller tankless heaters. But you could say these same issues are to be had with stored water tanks. Another small disadvantage to consider is that when it comes to tankless water heater repairs, installation or service, there are fewer plumbers and technicians who are familiar with them. There are essentially three ways that water is heated in these devices. The first we’ll look at does it’s job through electricity. Electric tankless water heaters have had a reputation of being unreliable and troublesome to install. With the right model and knowledgeable installer, reality is that these are just as good as any type. Electric tankless reviewers will tell you that these can be easy to install since there are no gas lines or vents to contend with; it’s just a matter of running the right (robust) wiring to an equipped breaker box. Gas tankless water heaters are usually great for homes that already used gas to heat water. Some calculate gas models to be cheaper overall if gas is considerably less expensive than electricity. If you want to avoid electric, this may be your option. However, if you don’t have gas service at your house, then a propane water heater is probably something to look at. You still have to install gas pipes and place a tank just outside your home, so keep in mind the extra cost, labor and materials that may be involved. Before getting into a more detailed tankless water heater review, let’s take a look at some of the top manufacturers and brands so you can become familiar. Here they are in no particular order. Bosch. Rinnai. Noritz. Takagi. Rheem, Chronomite, Eemax, Stiebel Eltron. When reviewing a tankless water heater to buy, you should be aware of some key considerations. A few of the most important are: first, what usage option are you looking for? For example, do you want something for your whole house, or what is called a point-of-use, such as at a bathroom or kitchen sink, or outdoors at a pool shower or BBQ area. Secondly, what demands do you have for hot water volume? Do you have many people in your home with multiple bathrooms, or is it just you and your spouse, and all the showers have low-flow nozzles? A third point to have in thought is something you probably didn’t know would matter; and that’s the ambient temperature of your initial water source. Is it cold, such as below 50 degrees? Depending on this temperature, will determine which tankless water heater is right for you. Below is a sample of some popular tankless heaters that serve an entire home. There are many models on the market, and any tankless hot water review that attempts to review and assess everything in the market would result in so much data that it’d be overwhelming for the average DIY plumber. Those models chose here are popular because of their selling history, buying decisions made by consumers like you who based their purchase on common requirements and considerations. These include: Product Cost (Price), Fuel Type (Electric, Natural Gas or Propane), Quality (Effectiveness and longevity) and any known complaints. As with the above review, the following is a sample of popular small or point-of-use tankless heaters that are designed to service a single sink or shower, and in some cases, a small bathroom. Using the same review criteria as above, these models are what stick at as the best for their particular purpose. In many cases, these models may have smaller or larger “brothers”, such as how many gallons per min (GPM) they’re rated for. You’re encouraged to research further any model and its siblings that is highlighted in the following tankless water heater review. (Note, review coming at a later time).